LOS ANGELES - March 14, 2019 - PRLog -- The United Premier Soccer League (UPSL) is excited to announce African Stars Football Club as a new league member kicking off with the 2019 Spring Season. Based in Salt Lake City (Utah), African Stars FC will begin play in the UPSL Mountain Conference, and is finalizing its venue for UPSL home games in compliance with UPSL Minimum Standards. 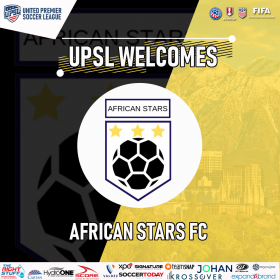 United Premier Soccer League National Director Matt Kahla said, "We are very pleased to welcome African Stars Football Club to the UPSL Mountain Conference. Diversity of club ownership is one of the strengths of the UPSL, and to have a club that has come together to represent their heritage is a movement we will always support. We wish African Stars FC good luck and look forward to seeing the talented players Owner Styve Kamungu has gathered for the season." African Stars Football Club is the first nationally-sanctioned African-immigrant owned and operated Pro Development club in Salt Lake City (Utah). Styve Kamungu is Owner and General Manager of African Stars FC. A native of the Democratic Republic of the Congo, Kamungu immigrated to the United States in 2011. African Stars FC Owner Styve Kamungu said, "These boys put in so much time and work and they don't get the same opportunities, and that's not correct. That's why we've all come together so that we can show everyone a different side of us. We like playing soccer, and this is helping a lot of players. We're also keeping each other out, and we're meeting up and helping each other find and get jobs and we want to try. We've been training so hard to play in the UPSL, and now we feel like we're ready." African Stars FC has played a series of competitive friendlies against local Pro Development clubs, including a 6-5 loss to San Juan FC earlier this year. "We came back in the second half after being down 4-1 in the first half. We lost that game but it was a success. We've got a lot of talent and now we're growing and things are getting better," Kamungu said. African Stars FC currently features more than 30 players on its active roster, Kamungu said, and will announce its upcoming game schedule. African Stars Football Club is an American Soccer club currently based in Salt Lake City, Utah, and a new member of the United Premier Soccer League. African Stars FC will play in the UPSL's Mountain Conference. Founded in 2017, African Stars FC can participate in the qualifying rounds for the Lamar Hunt U.S. Open Cup through their affiliation and membership with the UPSL, the U.S. Soccer Federation (USSF) and the United States Adult Soccer Association (USASA).